A cereal bar fit for rock climbers. There’s no denying it: when I’m on a mountain, I want my calories. On a recent climb, having run out of both food and water, the path down the mountain was occupied with intense fantasies about ice-cream, salty crisps and about as much icy water as my stomach could handle. It’s common sense that when you’re exercising, unless you’re trying to shed the pounds, you need to increase your calorie intake. When it’s exercise over a long period of time such as a day on the hill in winter, obviously you need to carry this food with you to avoid crashing from low blood sugar. But however much some of us would like it, a tub of Ben & Jerry’s just isn’t practical… So the question is, what works best? Well, it depends on what you’re after. Me, I want healthy calories in a form of both slow and fast release carbohydrates with proteins too. I want some fast release energy because I’m hungry, but I don’t want to crash minutes later with a headache. I want something I can eat a lot of and that has good nutritional and fibre content because on long trips vegetables can be hard to come by. I want something I can eat without having to remove my gloves, and not require too much attention to consume so I can eat it without tripping over my own feet if I’m munching while marching. I want something I can stuff in my trouser or jacket pocket that won’t leak, morph into a sticky mess or turn into an unidentifiable mush if it gets knocked against a rock face. It also needs minimal preparation and a good shelf-life. Surprisingly, unless I’m flagging badly, I don’t actually want chocolate. I crave savoury things: roasted peanuts; tuna melt; jelly beans (ok, that’s not savoury, but you get the point). 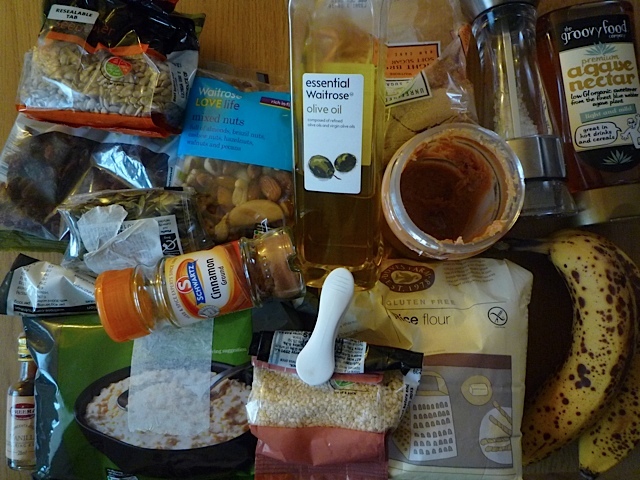 I worked out that the best mix of foods to keep a steady supply of energy to the system, along with being compact and having a good calorie to weight ratio is oats, bananas, nuts and dried fruit (I tried boiled eggs, but after several months of removing tiny fragments of shell from the lid of my backpack, and having dodgy breath, I gave up). The fruit sugars are natural and unrefined, the oats and banana are slow release and the nuts are a great source of protein and fat. 1) Oats. I’m not a horse and don’t generally climb with a nose bag, so lets assume oat cakes. These are lovely with a cup of tea, but on a walk, lets face it, they’re dry. The result of eating oatcakes on the hill is a clogged up mouth and a water bladder with masticated ground oats coating the mouth-piece (that’s the last time Robin lets me share…). 2) Bananas. Banana’s are great, and some strange people even like them when they’re bruised. Unfortunately, I’m just not a fresh banana person. Whole dried bananas are wonderful, but ‘very’ sticky and look… well… suffice to say I’ve gotten a few odd glances at times. 3) Nuts. Got to love nuts. Unless you have a nut allergy of course, in which case you’re excused. Chocolate covered nuts: heaven. I should probably do another inappropriate joke here, but I’m pretty sure my mum’s going to read this, so I’ll leave to you to fill something in… The only problem with nuts is that they’re highly spillable, require two hands most of the time, and have the disgraceful habit of wandering out of the packet to visit the inside lining of your pocket or the stomach of nearby wildlife. 4) Dried fruit. Again great, but with the same problems as nuts. Although I do have lovely memories of feeding crows on a mountain top in Italy – they do tricks for raisins. The obvious answer here is cereal bars. Unfortunately, commercially available cereal bars often have lots of preservatives and are usually packed full of refined sugar or just don’t have good quality ingredients (stingy on the nuts…). Those that are advertised as healthy or natural are ridiculously expensive, can be bulked out by low calorie ingredients such as puffed rice and, I find, often taste sickly sweet. Robin gets through a crazy number of cereal bars, and not just on the hill; they are a staple element of his daily snacking. In order to, therefore, save money and make sure that my man and I were getting something nutritionally healthy and usable on the hill my quest for the perfect cereal bar began! Like any modern quest, mine began on the internet. I trawled a lot of recipe sites and even foodie blogs, trying to find a recipe for cereal or granola bars which would meet all of my ‘perfection’ criteria. One big stumbling block I hit was how to create a bar which holds together well without pumping it full of fat and sugar? Most recipes, I discovered, were basically flapjacks with a bit of other ingredients added. Very nice, certainly, but not healthy and delivering calories from the sources I wanted. Then, I hit gold. Or rather, mashed banana. The humble banana, allowed to decompose, sorry, ripen, and beaten into a pulp with a potato masher was the answer to all that fat and sugar. 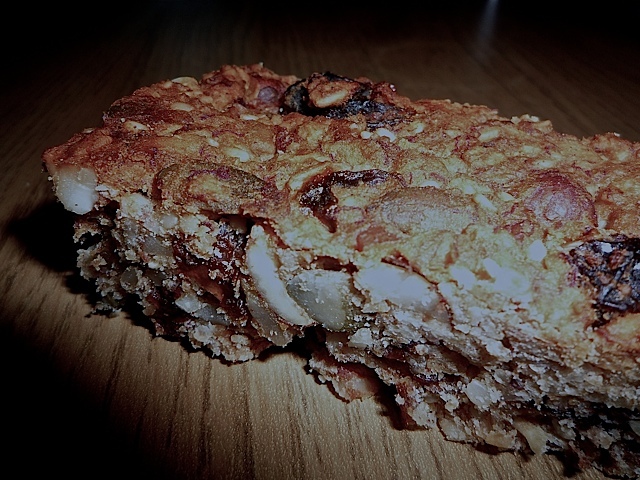 After many experiments, (mostly) happily eaten by Robin, I managed to put together a recipe which results in an oat, fruit and nut bar which is both soft, but firm enough to carry on the hill without falling apart. The best part of it is that the recipe is surprisingly flexible. You can use whatever fruit or nuts you’re partial to. If you’re gluten intolerant, use rice flour. If you’re vegan then this should also meet your criterion. If you’re allergic to nuts… well, tough luck. If you want it sweeter, just increase the proportion of fruit. If you want it firmer, cook it for 5 minutes longer. The ingredients for the cereal bars. Preheat your oven to 175 degrees centigrade. Line a baking tray with parchment. I use a large lasagne dish lined with greaseproof paper, approximately 2 by 1 hand width. 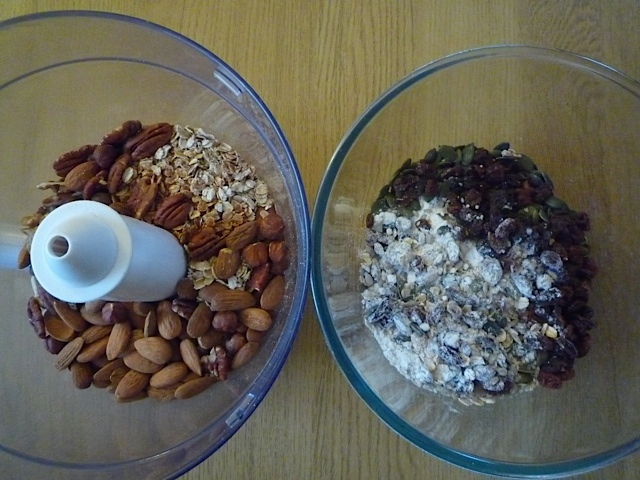 Combine the 2/3 cup of jumbo oats, flour, cinnamon, salt, small seeds, sunflower & pumpkin seeds and dried fruit. Set aside. Chop in a food processor the 1 cup of jumbo oats and nuts. If you’ve brought oatmeal or pre-bashed nuts, then skip this stage and add into the step before. If you want your cereal bars quite sweet, add in the dried fruit to this stage and chop them lightly. Mash the bananas in a large bowl, then add the sugar, syrup, oil, nut butter and vanilla extract. Mix this together well, then stir in the dry ingredients. Mix until everything is well coated. Transfer the mixture into a baking tray and press in evenly and firmly using a sheet of cling film (remember to remove this before baking!). Bake for about 35-45 minutes depending on how firm or soft you want the bars. Cool the bars completely within the baking tray. Once at room temperature (or below), slice into bars and store in an airtight container. Personally, I wrap each bar individually in cling film and then put them in the freezer meaning that they’re ready to grab on the way out of the house each morning. Yum…very enjoyable and tasty read. Can’t wait to try out the recipe. But do you really do your ingredient shop at a certain rather exclusive supermarket chain? I’m expecting a recipe for a homemade isotonic drink in the next guest blog. Yes, they are rather middle class cereal bars! Hope you enjoy them as much as we do. Here you are a possible drink for mountaneers:boil up one or two cups of black leaves tea in a big cooking pot for about 30 minutes;put in blender two cups of liquid with two tablespoons of salt and half a cup of butter;that should make two cups of Sherpa su-cha,their “honorable tea”,disgusting as a tea,miracoulous as energy drink. Sherpa farmers and porters take one meal a day and go on simply drinking this salty tea,i drink it on wintertime or when i climb the 4.000 summits in Western Alps,it works! That does sound like it would taste terrible, but I might give it a go at some point just to see see if it works.